Managed to post one decent picture last time after months of waiting, I continued to look for the opportunity for the bird to show up again and, most importantly, at the right time (when I am ready to fire the shot). This moment finally came, and I was able to take 7-8 pictures from different angles. The natural camouflage as such, can you even tell its existence if this little guy is not moving? Bushtits come in a flock and leave as a group. I wonder if they have a leader in command. Suet is one great winter protein source for the birds. This little guy, a ruby-crowned kinglet, was around a lot this winter. However, he usually came early in the morning when it’s still dark outside, and once he got his bite, he did not hang out. I don’t sit around waiting to take bird pictures and the chance of getting a good shot is very slim. Still hoping to get some better pictures. I saw Townsend Warbler the first time about 5 years ago, and they rarely showed up until this year. I have to credit this peanut butter that I was recently introduced to. It smells just like fresh peanut butter and the birds love it. 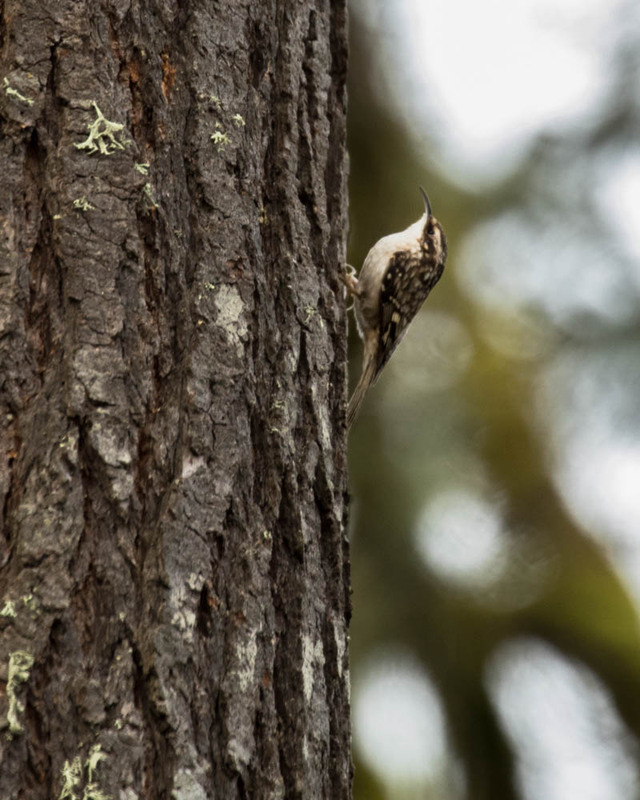 Brown Creeper is the reason this bird’s peanut butter was first created. I scraped the butter on the bark, but the Creepers so far have not been able to taste it. Squirrels seemed to always come before the Creepers. Creepers make their move by creeping up and down the tree trunk. I am still trying to figure out how to feed them without the nuisance from the Squirrels. Believe or not, backyard birds have become part of my life.